Blitz the following ingredients in a blender to a rough / course consistency (too smooth and they don’t bind well), and then bake for 10mins at about 160ºC to 180ºC. Massive hat tip to Mark Sisson of Marks Daily Apple for the rough base idea for these. 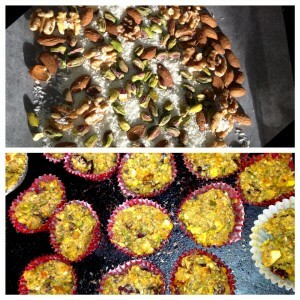 This entry was posted in Recipes and tagged Paleo, Recipes, Supplementation. Bookmark the permalink.